Labour and Employment Secretary Afroza Khan on Thursday assured that the reported wage disparity of Readymade Garment workers will be resolved as early as possible. She also urged the demonstrating garment workers to return to work keeping trust on the government alleging that a vested quarter is trying to create anarchy in the RMG industry. 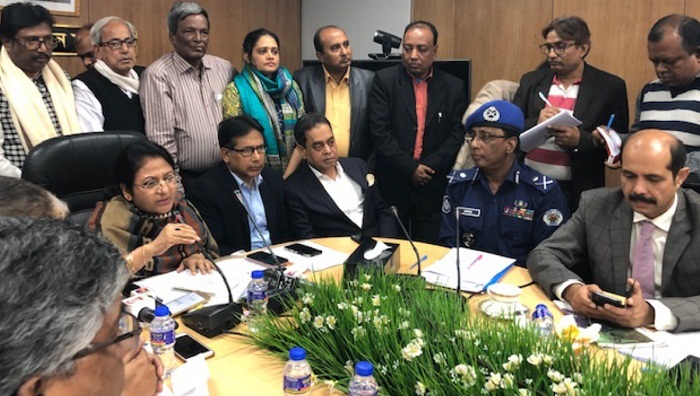 She came up with the call after the maiden meeting of a committee, formed by the government to review the wage structure for the RMG workers, at the Secretariat, reports UNB. Mentioning that the committee was given one month to put forward its recommendations, the secretary said they will submit those as soon as possible. Afroza Khan claimed that many factories provide wages more than the wage structure but workers were also vandalising such factories, too. She urged all to remain alert as there are many quarters which are working from outside. The next meeting of the committee will be held on Sunday, she said. Afroza Khan said a hotline service will be opened where workers will be able to lodge any complaint round the clock to get remedy.